Has it really been almost 20 years since I started drinking New Glarus? I recall buying a six-pack of Edel Pils as soon as it was available in Madison. Robin Shepard has a lengthy piece on New Glarus Brewing. He reviews the brewery's history and notes the release of its 20th Anniversary Ale, a take on the Belgian Dubbel. New Glarus 20th Anniversary Ale is a robust and flavorful beer made with a combination of American, English and Belgian malts; American and German Hops; and a touch of Belgian candi sugar. Single 20-ounce bottles go for around $9 each. "This is a strong beer, one you'll want to share," adds Dan. It's also a beer that's best served warmer than refrigerator temperatures to bring out its rich sweet plumb and chocolate-y flavors. 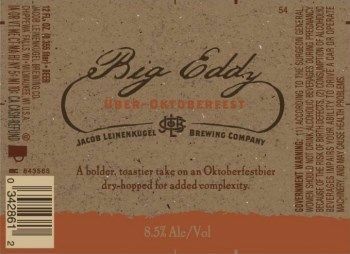 The Big Eddy Über Oktoberfest will be a hefty 8.5% ABV and also dry-hopped. Release date is late August. 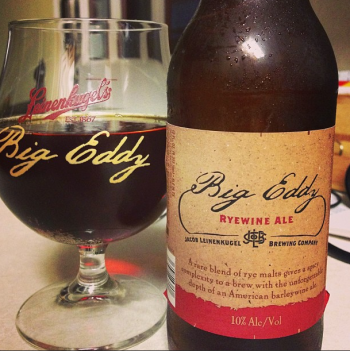 The Big Eddy Ryewine (photo grabbed from this page) sounds very tasty as I love rye. It will be 10% ABV. I am hoping that it is being released next month so that it can age in the cellar and that Leinenkugel isn't actually expecting anyone to drink this stuff during the summer. 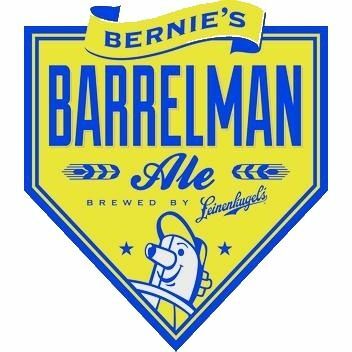 Lastly, that Bernie's Barrelman Ale is a new beer to be available only at Miller Park. Sounds like a pale ale. Hopheads will be happy to hear that it has Cascade hops in it. Kirby has brewed an American IPA. It's available at all four Madison-area Great Dane locations. 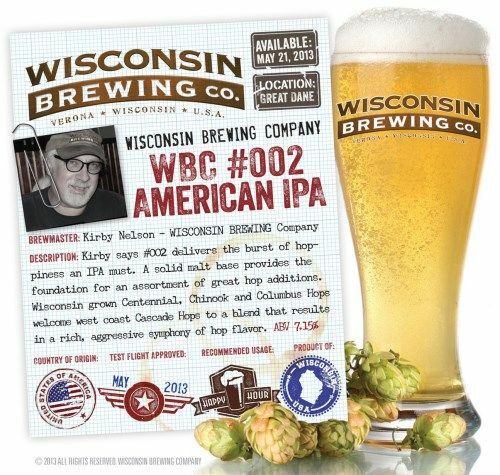 The Wisconsin Brewing Company is looking for comments on it and, if I ever get around to trying it, I will be happy to give commentary. Scott Manning of Vintage Brewing was on TV recently sporting his fancy brewing overalls and hogging the camera as his assistant toiled in the background. He brewed his Rhine Heights Kölsch earlier this week and I am looking forward to it. Lastly, a fond farewell to Joe Walts who is leaving Ale Asylum – indeed, leaving Wisconsin – to become brewmaster at Narrows Brewing in Tacoma, Washington. I am purposely keeping the DVDs he lent me so I have an excuse to go west and barge into the brewhouse once it's up and running. No one has ever taught me more about water softness than Joe. Best of luck to him and his family. Now who will I homebrew a dunkles with? Well, we had a brief spell of warm weather before spring asserted itself again. Luckily I managed to get in some more Berliner Weisse drinking before the chill and rain took over. Earlier this month it was Blue Lady. 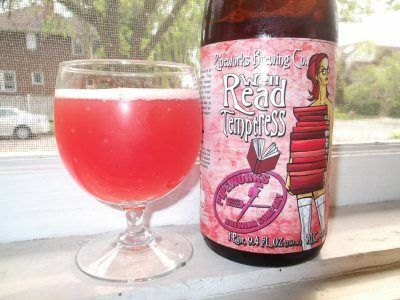 This time we have Well Read Temptress, another Berliner Weisse from Chicago's Pipeworks. Often times folks add Waldmeister (woodruff) or Himbeere (raspberry) syrup to Berliner Weisse but here the beer has been aged on fresh raspberries which adds a nice twist. Temptress pours cloudy just like its blue sister and is a pretty light pinkish red. I got some nice foam atop it all but the stuff dissipated fairly quickly. There weren't a lot of bubbles visible in the glass which is very deceiving. The beer smells like summer. Its heavenly aroma has fresh raspberries first and foremost followed by a bit of the sourness. Like the aroma, raspberries are the first thing you taste. My big complaint with Blue Lady was that the blueberry flavor wasn't prominent enough and I'm happy to report that Well Read Temptress doesn't suffer this same fate. The raspberry is more plentiful here though not overpowering. It shares your tongue with the lemony tartness well. The lactic acid provides just the right amount of tartness for me. You can't miss it but it is also not going to make you pucker so much that you permanently distort your face. And as with Blue Lady, breathing in while drinking enhances the berry flavor. The mouthfeel is light and, while you can't see much in the way of bubbles, you can certainly taste the carbonation. It finishes with a smooth, lingering sourness. I adore Well Read Temptress. It was nice to taste that Pipeworks got the perfect amount of raspberry into this beer to balance the tartness. It is 4% ABV which is quite sessionable and is wonderfully refreshing. Junk food pairing: Go with sour cream and cheddar kartoffelchips. I see that Sushi Express has opened where Big Red's used to be on the 600 block of University Avenue. They even deliver. As I walked by I thought about how prevalent sushi is. At what point does does a non-American "ethnic" food become American? At some point hot dogs, being of Germanic origin, became standard American fare. I stopped at a Freiderick's Family Restaurant in Fennimore earlier this week and there was an all you can eat taco bar. Tacos are American now too. I suspect that sushi has some time yet before it becomes as American as hot dogs and tacos but it's getting there. It is no longer considered to be some exotic Japanese dish. Grocery stores sell sushi and I suspect it won't be long before PDQ and 7-Eleven start doing so if they haven't already. Craft brewers’ obsession with hops has overshadowed so many other wonderful aspects of beer. No doubt hopheads at Beer Advocate have their knickers in a twist now. While not the perfect plea for more/different diversity in the craft beer world, I am happy to see overly hoppy beers get knocked in the press. Is Madison a bastion of cultural conformity? On the surface, Madison has many progressive aspects. Sustainability and the “greening of the city” stand front and foremost as two easily recognized. Curbside recycling and composting, increasing investment in bicycle transportation, native gardening, and urban farming. There is an intense concentration of a wide range of alternative health practitioners. Artisan craftspeople abound, creating specialty foods and other handcrafted products. “Shop local” is the resounding cry to support small businesses, and farmers markets adorn every neighborhood in the summertime. Idyllic as this sounds, there is a less appealing aspect to this picture. As Madison concentrates is cultural practices into a few baskets, the proliferation of other ideas diminishes. Ten years ago I would have characterized Madison as a place that had progressive perspectives. Now I would characterize Madison as a place with few ideas, all perpetually reinforced and more deeply ingrained every day. People regurgitate a handful of versions of the same thoughts in ever narrowing expressions. Everywhere you look it is repetition of the same ideas, whether it be on politics, design, or social culture. People strive to look the same, to dress the same, and to have the same lifestyle. It is so pervasive, that women within a 30 to 40 year age range may display similar choices in hair, dress, and accessories. What began as a city with progressive and forward looking ideas to develop a new urban course has become a closed container of cultural conformity. There is a new cookie cutter in Madison, and it is young, alterna-hip, and white. Truth be told, this is a quote from an article called "Leaving Portlandia" and I swapped out every instance of "Portland" and replaced it with "Madison". But does it still apply here? I've never been to Portland so I cannot vouch for the accuracy of the article but I do think there is a sense of homogeneity here in Madison. Words like white, middle-class, locally sourced, Democratic, and indie rock seem applicable to Madison whereas words such as multiracial, blue-collar, diverse, and hip-hop seem less so. 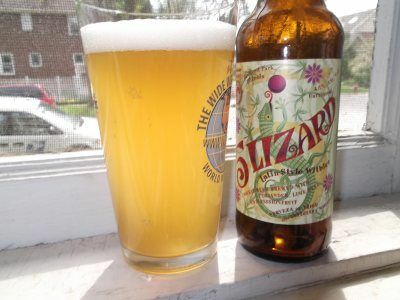 With the weather finally moving into summer territory I thought the time was right for some 5 Lizard, a Latin-style witbier by Chicago's 5 Rabbit. I first time I had it was at The Great Taste of the Midwest a year or two ago and loved it on that 80+ degree day. A fantastic summer brew. The witbier is a Belgian wheat beer commonly spiced with coriander and bitter orange peel. Here the folks at 5 Rabbit replace the orange with lime and give it a tropical twist with the addition of passion fruit. 5 Lizard poured a hazy yellow and had a nice, frothy white head. (I believe both of these characteristics are due to the wheat.) The glass really glowed in the sun on my porch. It was well carbonated too. Upon smelling it, my nose was struck by the passion fruit first and foremost but there was also a slight bit of herbal hoppiness in there. The beer has a light and bubbly mouthfeel along with a lovely creaminess on the tongue which I think it owes to the oats in the grain bill. The passion fruit is prominent here with its succulent sweet and sour flavor cozying up to your tastebuds. The tanginess of the lime was also present making this a very fruit forward beer with the carbonation accenting these flavors. While fainter, the coriander was unmistakable. To top things off there was also some graininess present that was vaguely sweet. That's a lot of flavors to juggle and 5 Lizard pulls it off well. The fruitiness dominates, to be sure, but the other flavors don't let it run away with the show. Everything balances out in the end. The brewery states that 5 Lizard has Motueka hops in it which I discovered to be a variety from New Zealand that has a citrus/tropical fruit flavor and a Noble hop aroma. While I caught the aroma, I'm not sure about the flavor. I didn't find it hoppy; then again, this is probably the first and only beer using Motueka that I've ever had and was expecting more of the Noble flavor since it was in the aroma. More fool me. The finish is smooth with the lime zestiness and more passion fruit goodness that lingers for a short time. I have to admit that I liked 5 Lizard even more than when I had it at The Great Taste. My tongue hadn't been battered with a dozen other brews when I had it this go round like it had been at the festival. It is light and smooth plus it has a delightful myriad of flavors that balance well. At 4.3% ABV this beer is quite sessionable and incredibly refreshing. Junk food pairing: 5 Lizard pairs well with friend plantain chips. Another trailer but this time it's about beer. Crafting a Nation One Beer at a Time is a new documentary that profiles various craft brewers. I recognize Jim Koch and Sam Calagione here but I'm not sure who the others are. The moviemakers really seem to be pushing the notion of craft brewers as blue collar artisans who sacrifice everything for the love of beer with the music here that is some of the most cloying, saccharine stuff ever. Sounds like second rate Townes van Zandt. This is the trailer for The Congress, a movie about an aging actress or model who sells her image and then things get all Phildickian. Looks interesting at the very least. It's based (loosely by the sounds of it) on a book by Polish sci-fi author Stanislaw Lem. I made the mistake of reading Business Unusual at the same time as I was listening to The Wrong Doctors by Big Finish which meant that I was consuming two stories at the same time both of which attempted to explain how Mel ended up traveling with The Doctor. It was confusing for a stretch as I kept thinking about Mel going to a play rehearsal while reading the book and wondering when The Doctor was going to head to SenéNet whilst listening to the audio drama. 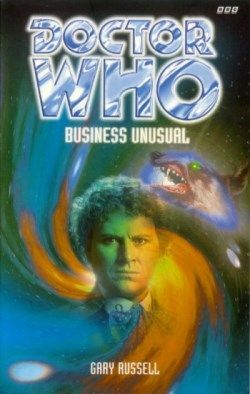 Business Unusual begins with the rather gruesome death of Robert McLaughlin at the maw of a mutant dog of some kind which drools green saliva and has green eyes. McLaughlin was a member of C19, a Torchwood-like outfit, and his assignment was to investigate the technology company SenéNet. Next thing we know The Brigadier is doing the same thing. While spared the fate of being eaten by a mutant dog, he is taken prisoner. Meanwhile The Doctor is helping out the Brighton constabulary by mopping up a mess that The Master had made in their computer system. While out and about he sees Mel from afar and does all he can to avoid her lest she become his traveling companion. If this is allowed to happen, he would move ever closer towards his own fate as The Valeyard. Time has a way of smoothing out changes made to it and of course our hero ends up meeting Mel. The Doctor runs into Trey Korte, an exchange student staying with Mel's family. Trey has some latent psychic powers which are discovered by the villains and this catches the attention of The Doctor. He is unable to avoid Mel at this point. Together they take on SenéNet which is headed by a man named Townsend. He has stolen various bits of alien technology from C19 and appropriating them for his own ends. He had previously augmented his body with that technology but it is now showing its age and he seeks to upgrade his mortal coil. In Townsend's employ are the Irish twins Cellian and Ciara. I read afterwards that all three appeared in Russell's The Scales of Injustice, a Third Doctor novel but, not having read it, I cannot judge how well or interesting these characters develop. The story here is reminiscent of The Green Death with the mysterious corporation and its equally mysterious CEO. But what makes Business Unusual different is how Russell gets into the heads of the supporting cast. Erskine is a former member of UNIT under Lethbridge-Stewart who was left for dead in one of the group's battles with invading aliens. As he seeks revenge against those who abandoned him and took his life away, The Brigadier contemplates the responsibilities of his job as well as the drastic consequences his decisions have at the human level. Cellian and Ciara had their minds manipulated by Townsend and are ruthless killers for most of the book but they eventually find what's left of their humanity. Alan switched on the car stereo system, which included a CD player, and Mel automatically selected her father’s favourite Pink Floyd album. There is, however, a scene out of character for The Doctor. Part of Townsend's plan has a couple dozen or so kids turned into zombies attached to computers. In one scene as his scheme is being foiled by The Doctor, our hero seems to care little about their horrible fate. Indeed, other children also have horrendous things happen to them which Russell describes in heartbreaking detail. A lot of Business Unusual is boilerplate Doctor Who but it is a very fun story. The Doctor-Brigadier combination was nice but it they are separated for most of the book so it was a bit of a letdown. What sets it apart is the way Russell treats the minor characters and gets into their heads and fleshes out their motivations and has them gradually change. Rich folks hire handicapped people so their rich kids can get into Disney World rides sooner. Rich moms shamelessly hire disabled tour guides so their kids can cut long lines. The “black-market Disney guides” run $130 an hour, or $1,040 for an eight-hour day. Dr. Wednesday Martin, social anthropologist who discovered scheme. Alfonso Cuarón finally returns with Gravity. Sandra Bullock and George Clooney star as two astronauts who survive the destruction of their space shuttle and are trapped in orbit. Presumably gravity gets a hold of them and they are slowly pulled towards the Earth. Emmanuel Lubezki is the DP here. He shot Children of Men for Cuarón and he's been Terrence Malick's cinematographer since 2005 so it should be pretty. I am not sure I can watch this much less on 3D IMAX. I'd probably get vertigo. Brat und Brau opened in Madison in 1969 moved to Mazomanie at some point but is now returning to Madison. It will be in the Northside TownCenter on north Sherman Avenue in the spot former occupied by Hamann Charcuterie. Here's what Nichole and JM had to say about their former iteration. A few weeks ago Terrence Malick's latest movie, To the Wonder was scheduled to open here in Madison at Sundance this month. The film's website now lists a 22 August date at the UW Cinematheque. What happened? Not to demean Cinematheque, because they are a great organization, but a week-long run would be really nice. Contra Rob Thomas, not everyone who wants to see it will be able to make it. Plus it's a Malick film. The bigger the screen, the better. I had a Beck's for the first time in ages a few months ago. It was my first since the conglomerate formerly known as Budweiser started brewing it in St. Louis. (Was the stuff for the U.S. market brewed in Germany prior to this?) I thought that it, like pretty much everything the conglomerate formerly known as Budweiser brews was watery. It certainly had more flavor than Bud but less than I remembered it having. 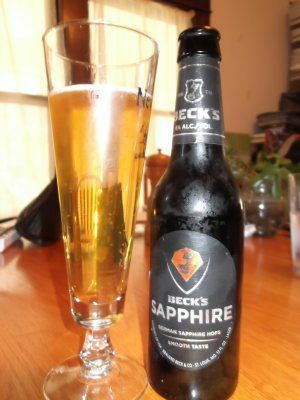 I thought about this when I heard that Beck's was introducing a beer brewed with a new(ish) variety of German hops called Saphir. I read that it was released in 2002 and is related to Hallertau but has more of a sweet, fruity, citrus-tangerine thing going for it. The hops sounded interesting so I thought I'd brave the waters of Beck's and give it a try. Things started out promisingly enough as it poured a dark straw color which was a stark contrast to the sleek black bottle. It was clear and filled with bubbles running up. The aroma was good too. It had that nice biscuity smell that's common to pale lagers but there was also a very sweet scent which was partly bready and partly fruity. To my nose the latter was like strawberries. Lurking in the background was a spicy hops scent – what I'd expect from Noble hop, Saphir's ancestors. The taste had some of the elements you'd expect from a lager like this; it was light on the tongue and had the aforementioned biscuit flavor. But it wasn't crisp and clean. There was this dull, mellow sweetness present that kind of tasted like the strawberries in the aroma. Very odd. Even odder was that, considering this beer was supposed to be featuring a new variety of hops, I really couldn't taste them. Unless, of course, that whole strawberry thing was Saphir fooling me. I certainly could not taste anything akin to tangerine or citrus generally. Sapphire finished moderately dry and with some mild hop bitterness of the spicy kind. This isn't an ungodly awful beer but it's certainly not good. I am left wondering where the crisp, clean lager qualities went and why I still have no idea what Saphir hops taste like. I thought the German Hüll melon hop variety was supposed to have strawberry nuances, not Saphir. Junk food pairing: Japanese rice cracker snack mix but the stuff that has wasabi peas in it. "Madison is a reality distortion field"
So says Joe the Planner. He was here a couple years ago when the Congress for New Urbanism had their annual soiree and wrote about what he found. His post is a couple of years old but interesting. In it he writes about the Capitol Square as a place of civic and commercial engagement. So, finally, here is the disclaimer: Madison is a reality distortion field. Yes, the conditions that undergird much of that city's success can't be duplicated in most other places. However, that success wasn't divinely ordained, either. Their reality is simply the cumulative product of the choices and sustained efforts of Madison's leaders and citizens. They've intentionally created a city for people, not cars. This is clearly reflected in the design of their streets and public spaces, which is the focus of this piece—and why Madison was an obvious choice of venue for the CNU. I bought this bottle last autumn and have been saving it for a warm day. Little did I know that it would take until the last day of April for the appropriate weather. (And we'll be reverting back to bock weather shortly.) Chicago's Pipeworks Brewing Company has been gaining a good reputation with IPAs that have "ninja" and "unicorn" in the name but what attracted me is the fact that they have brewed four varieties of Berliner Weisse. In this case, we have one that was aged on fresh blueberries. Berliner Weisse is a sour wheat bier that is top-fermented and seems to come from a family of Northern German beers which also includes Gose, the grätzer/grodziskie, and Lichtenhainer. As lagering became trendy and Bavaria's Reinheitsgebot became the law of the new country called Germany, these styles either died out or hung onto their dear lives by a thread. Berliner Weisse, then, is something of a relic of the days before the pils became ubiquitous and I've read that there were hundreds of breweries making Berliner Weisse in Berlin at one time. Blue Lady is a very pretty beer. It's a light purple with a distinct reddish tint and is hazy. She is well-carbonated with lots of big bubbles giving a large head that dissipates quickly. Pouring it sounded like pouring soda or champagne with that loud fizzy sound. And the aroma was marvelous as well. The bright sourness came first but found some balance with sweet blueberries. As you would expect, the lactic acid really comes through on the palate. It is very sour at first but mellows a bit to a lemony tartness. The Berliner Weisse used to naturally pick up brettanymyces back in the day but there's no hint of a wet blanket here. Disappointingly, the blueberry is very much in the background where it mixes with a floral flavor. I wasn't expecting Blue Lady to be sweet as when you serve a Berliner Weisse mit Schuss - with a now-traditional shot of Himbeere (raspberry) or Waldmeister (woodruff) syrup, but I was hoping for the berry flavor to be a bit more prominent. I found that it helped to breathe in the aroma while drinking as this brought out the blueberry. Before having drunk enough of it to neutralize most of my tastebuds, I caught some clove as well as a bit of herbal hoppiness and the beer was moderately dry overall. Blue Lady is 4% ABV which I believe is a bit higher than the Berliner Weisses being brewed in Germany today but it still has a light bubbly mouthfeel. It finishes dry and tangy. 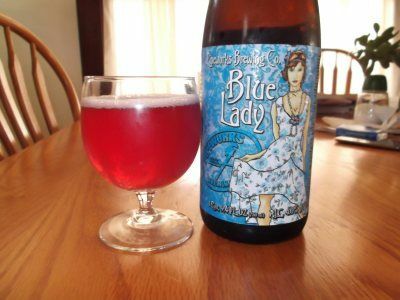 Despite the paucity of blueberry, I very much liked Blue Lady. It has a nice tartness which was augmented by the berry flavor just enough to make things interesting. Plus it was extremely refreshing in yesterday's 85 degree heat. It's too bad that Wisconsin brewers don't brew this style. At least they don't bottle it if they do. The last time a local Berliner Weisse was on store shelves here must have been back in 2008 with New Glarus' take on the style. I thought Blue Lady was just a touch less tart than Dan Carey's brew. Junk food pairing: Provolone Cheez-Its. The creamy cheese flavor will sit well against the tartness of the beer and the subtle smoke flavor will fool your tongue into thinking you're drinking a Lichtenhainer.